Harry Sutherland Lawson was born on 5 March 1875 at Dunolly, Victoria, the only surviving son of John Wightman Lawson, Presbyterian minister from Scotland, and Penelope Bell, née Hawkins. He was educated at Castlemaine Grammar School, and in 1891 at Scotch College, Melbourne, where he read the lessons regularly as befitted ‘a son of the Manse’. In 1892, he was articled to F. K. Best, Castlemaine barrister and solicitor. Lawson, who became a notable footballer, was a member of the Castlemaine Borough Council from 1898 to 1915 and Mayor of Castlemaine from 1905 to 1906. In 1908 he was admitted to the Bar and joined F. S. Newell in a partnership at Castlemaine. The firm later opened a Melbourne office and by 1927 had become H. S. W. Lawson and Company. Mr. Lawson, who is called ‘Harry’ by every man, woman and child in his constituency, devotes all his political energies to the task of keeping his seat, and appears likely to succeed in this task for ever and ever. He has the wisdom to speak seldom, but vote often; and never to do anything which might awaken discussion or comment of any kind . . . They say that he was absolutely without a rival in district football, and might have become the champion of any metropolitan team; but when the dignity of Parliamentary honours was thrust upon him, at the age of twenty-four . . . he gave up the muscular game. It seems a pity. Despite these journalistic reservations, by 1913 Lawson was President of the Board of Land and Works and Commissioner of Crown Lands and Survey in the Watt Government, portfolios he continued to hold with the change to the Peacock Government in 1914. Following a ministerial reshuffle in 1915, Lawson became Attorney-General, Solicitor-General and Minister for Public Instruction. He was particularly interested in education and sought to promote secondary, especially technical, education. He also resisted the anti-German sentiment that tried to force the closure of Lutheran schools in western Victoria. He kept up a keen interest in the issues affecting his constituents, such as land settlement and agriculture, and water conservation. Lawson was out of office in 1917, but in March 1918, following factional duels over the premiership, the National, formerly the Liberal, Party turned to Lawson, who tended to aim ‘at a fair thing’, as a compromise party leader and premier. He spent six eventful years as premier of Victoria as he coped with the convoluted politics associated with the rise of the Country Party, and the social turbulence that accompanied the conclusion of World War I. In July 1919 a protest meeting of over 2000 returned soldiers outside Parliament House in Spring Street degenerated when rowdy elements of the crowd burst into the premier’s office in the Treasury building, where one of the protesters succeeded in striking Lawson over the head with a wooden inkstand. As a result of what the Argus described as this ‘dastardly’ act, Lawson attempted, though unsuccessfully, to widen provisions of the state’s Unlawful Assemblies Act 1915 so that demonstrators could be excluded from the precincts of the public offices surrounding Parliament House. The first Lawson Government (1918–23) initially enjoyed control of the Assembly, but the 1920 election left the National Party short of a majority and Lawson, despite his hope of moulding the party into ‘a harmonious whole’, depended on support from the Victorian Farmers’ Union. Lawson’s determination to abolish a compulsory wheat pool, along with the Country Party’s view that it should enter the ministry only if offered a majority of positions, caused this support to be withdrawn, and his government fell. After a trip on government business overseas in 1923, Lawson was saved from defeat by the support of the Labor Party, and in September resigned his commission and formed a National–Country Party Ministry with John Allan, the Victorian Country Party leader, as his deputy. The coalition never had full support from the Victorian Farmers’ Union, who, in 1924, refused to agree to an electoral alliance. 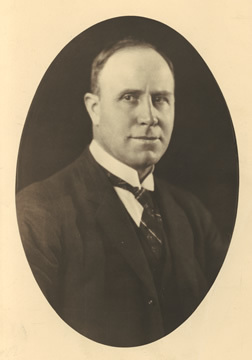 Lawson, who had survived three censure motions between 1920 and 1923, then dismissed his Country Party ministers to form a purely National Party Cabinet. Tired of the turmoil, and with a change of leader mooted, Lawson resigned as premier and stood for the office of speaker, but was defeated by a Country Party candidate and retreated to the backbench. Lawson’s political achievements were considerable. His premiership had seen the fostering of the State Electricity Commission; the encouragement of land settlement schemes; and the formation of the Melbourne and Metropolitan Tramways Board, the Forests Commission and the Charities Board. His government also perpetuated the six o’clock closing of hotels. It attempted to combat the 1923 police strike by passing the Public Safety Preservation Act, regarded widely as ‘a draconian measure’. After moving to the backbench Lawson nurtured his legal practice and his party political interests. In 1925 he was elected president of the Victorian branch of the National Federation and by 1928 was a member of the executive of the Australian National Federation. In the following year he became the party’s campaign director. I desire to voice a grievance. While there has been an elaborate collaboration going on between the high commands on both sides of the chamber, the rank and file have not been taken into their confidence. I am inclined to ask Senator Rae if he cannot form a union to see that our rights are properly protected. Senator Rae—Have I any guarantee that the honorable senator would stick to that union? The following year, Lawson was among those Nationalists who, during the committee stages of the Conciliation and Arbitration Bill, opposed providing arbitral powers to conciliation commissioners. As in Victoria he advocated a voluntary, not a compulsory, wheat pool and joined the senators who voted against their rural colleagues to defeat the Wheat Marketing Bill in 1931. Lawson was one of the seven members of the Select Committee that inquired into the Advisability of Establishing Standing Committees of the Senate. In May 1930 he seconded the motion of Senator Colebatch for the adoption of the select committee’s first report. Lawson saw the committee’s recommendations as providing machinery for ‘evolutionary growth’ and emphasised that standing orders be amended in order to facilitate the reference of bills to committees. (The standing orders were amended in 1932 so that referral no longer meant that the second reading should be deferred for six months, as previously.) In August he was a member of the highly political Select Committee on the Central Reserve Bank Bill. The committee had been appointed by the Nationalist senators (Labor refused to join) in order to shelve the controversial Central Reserve Bank Bill—the relevant standing order under which the committee was appointed allowed for the postponement of the second reading speech for six months while the committee met. It was a specific example of Lawson’s reason for wanting the standing order amended, though in this case it worked in his party’s favour. The Scullin Government was defeated in the December 1931 election and the newly formed United Australia Party came to power under the leadership of former Labor minister, Joe Lyons. In October 1933 Lawson joined the Lyons Cabinet as Assistant Minister (Treasury) and in the following year he was also Minister in Charge of Territories. For a short time in 1934 he served as Acting Postmaster‑General. In July he announced his intention of not standing for the forthcoming federal election, and resigned from the ministry after the election in September. He had been knighted in 1933 and there was speculation in Melbourne that he might return to state politics. Some in the UAP thought his decision may have been influenced by the hardline attempts by the Country Party leader, Earle Page, to have Senator R. C. D. Elliott included on the joint UAP–CP ticket. Lawson’s son Robert later wrote that his father had found ‘the repeated journeys to Canberra by train to be rather tiresome, changing at Albury about midnight when members foregathered on the platform with social and political exchanges during the 20-minute wait’. Most likely, Lawson thought thirty-five years in state and federal politics sufficient. After leaving the Senate he worked in his law firm and, moving to Melbourne in 1939, served on the boards of several companies including the Perpetual Executors and Trustees Association, Robert Harper and Company, and the Argus and Australasian Ltd. For fifteen years, until the time of his death, he was chairman of the Colonial Mutual Life Assurance Society. From 1922 he was a trustee of the Melbourne Cricket Ground and in 1946, chairman of trustees. From 1933 he was a trustee of the Shrine of Remembrance. (Earlier he had urged that a national war memorial be established in Melbourne.) He remained in touch with the political scene, and in 1941 was appointed by Prime Minister Fadden to the Capital Issues Advisory Board. Lawson died at St Andrew’s Presbyterian Hospital, East Melbourne, on 12 June 1952. On 8 October 1901, he had married Olive Adele Horwood, daughter of a consulting engineer who was at one time a Castlemaine iron foundry proprietor. The ceremony was conducted at the Horwood family home, ‘Bambra’, Tooronga Road, East Malvern, by a Presbyterian minister. Harry and Olive had four daughters, Olive Bell, Helen Mary, Jean Ethelwyn and Ina Constance, and four sons, John Horwood Wightman, Robert Sutherland, Donald Forsyth and Harry Horwood. Olive had died in 1949 and Lawson’s youngest son, Harry, a member of the Royal Australian Air Force, was killed in Scotland in 1941. The other children survived their father. Lawson’s passing was marked by an extraordinary issue of the state government gazette. He was accorded a state funeral at Toorak Presbyterian Church and cremated at Springvale. His ashes were buried in the family grave at Castlemaine Cemetery at Campbell Creek. Three days after his death a memorial service was held for Lawson at Castlemaine Presbyterian Church. A stained glass window in the church, a gift from the family, remains as a memorial to him and to Lady Lawson. There is also a portrait of Lawson by artist John Longstaff in the Castlemaine Art Gallery and Historical Museum, and a bronze sculpture in Lyttleton Street, Castlemaine. In November 1951 Lawson had delivered a speech at a dinner to celebrate the centenary of the Victorian Parliament, which was where the former Castlemaine footballer had made his political career. His Senate term was really only a postscript. Donald S. Garden, ‘Lawson, Sir Harry Sutherland Wightman’, ADB, vol. 10; Raymond Bradfield, Castlemaine: A Golden Harvest, Lowden Publishing, Kilmore, Vic., 1972, p. 44; History of Scotch College Melbourne 1851–1925, Scotch College History Committee, Melbourne, 1926, p. 463; G. Harvey Nicholson (ed. ), First Hundred Years: Scotch College Melbourne 1851–1951, Scotch College Centenary History and Register Committee, Melbourne, 1952, p. 129; The Scotch College Melbourne: Seventieth Anniversary 1895–1921, Melbourne, , p. 20; Argus (Melb. ), 22 Mar. 1919, p. 6; Castlemaine Mail, 7 Jan. 1927, p. 2; Table Talk (Melb. ), 17 Feb. 1927, p. 13. Punch (Melb. ), 19 Dec. 1907, p. 892; Herald (Melb. ), 5 June 1926, p. 13; Castlemaine Mail, 14 June 1952, p. 1; Argus (Melb. ), 22 Mar. 1919, p. 6, 22 July 1919, pp. 4, 5, 23 July 1919, pp. 8, 9. B. D. Graham, The Formation of the Australian Country Parties, ANU Press, Canberra, 1966, pp. 124–8, 145–7, 157–67, 198–201; VPD, 21 Mar. 1918, pp. 892–3, 11 Sept. 1923, p. 904; Ulrich Ellis, A History of the Australian Country Party, MUP, Parkville, Vic., 1963, pp. 60, 73, 112, 132–6; Argus (Melb. ), 15 Mar. 1924, p. 35, 21 Mar. 1924, p. 8; VPD, 24 Nov. 1920, p. 202, 13 July 1921, pp. 117–25, 19 Sept. 1923, pp. 929–33; Argus (Melb. ), 1 May 1924, pp. 4, 11, 23 Sept. 1925, p. 27; Australian National Federation, agenda paper of the fifth interstate conference, Canberra, 1928. Melbourne Graduate, June 1953, pp. 41–2; Castlemaine Mail, 25 Sept. 1928, p. 2, 26 Sept. 1928, p. 2; CPD, 28 Aug. 1929, p. 327, 11 Dec. 1929, p. 1020, 12 Dec. 1929, pp. 1110–11, 5 Aug. 1930, pp. 5222–3, 3 July 1930, pp. 3609–14, 6 & 7 Aug. 1931, p. 5079. CPP, Select Committee on the Advisability or Otherwise of Establishing Standing Committees of the Senate, reports, 1930; CPD, 1 May 1930, pp. 1316–19, 7 & 8 Aug. 1930, pp. 5581–2; L. F. Crisp, Australian National Government, Longmans, Green & Co., Croydon, Vic., 1965, p. 305; J. R. Odgers, Australian Senate Practice, 2nd edn, Commonwealth Government Printer, Canberra, 1959, p. 121. Herald (Melb. ), 16 May 1934, p. 4, 2 Jan. 1933, p. 10, 21 July 1934, p. 8, 23 July 1934, p. 5; Ellis, A History of the Australian Country Party, pp. 204, 207; Robert S. Lawson, Sir Harry Lawson, Premier and Senator, Mullaya Publications, Canterbury, Vic., 1976, pp. 78–9. The editor acknowledges assistance from Graham Bird, Commonwealth Bank Archives, David Studham, Librarian, Melbourne Cricket Club and Chris Edrich, Secretary, Shrine of Remembrance Trustees; Colonial Mutual Life Assurance Society, Reports of the Directors, 1920, 1952; VPD, 27 July 1927, p. 243; Herald (Melb.) 27 Feb. 1941, p. 16. Bradfield, Castlemaine: A Golden Harvest, p. 46; Age (Melb. ), 6 Sept. 1949, p. 4, 16 June 1952, p. 6; Argus (Melb. ), 13 June 1952, pp. 7, 11, 15 Dec. 1924, p. 10; Castlemaine District Association of Pioneer and Old Residents, Souvenir Jubilee Booklet of Our Fiftieth Anniversary, Castlemaine, Vic., 1931; CML Outlook, June 1954, p. 1; Castlemaine Mail, 30 Nov. 1928, p. 2; The editor is indebted to Sir Harry’s granddaughter, Mrs Catherine Dennis of Bendigo and also to Peter Perry (Director) and Clare Gervasoni, Castlemaine Art Gallery and Historical Museum; Age (Melb. ), 14 Nov. 1951, p. 4, 15 Nov. 1951, p. 2; VPD, 1 July 1952, pp. 754–5. This biography was first published in The Biographical Dictionary of the Australian Senate, vol. 2, 1929-1962, Melbourne University Press, Carlton, Vic., 2004, pp. 116-120.